Proverbs is a rootz reggae band known for performing music with "strong lyrical content and musical expressions to uplift Rasta livity." The band specializes in performing socially conscious roots music and they "endeavor to promote Ancient Wisdom through the art of music, thereby spreading the spiritual message of JAH RASTAFARI through word power and sound." When the band performs, their "MUSICAL POETRY, ROOTZ RASTA STYLE", it compels the audience to get up and dance. The band is diverse musically. Collectively, the band's members bring their own unique musical gifts to transform Proverbs into an "eclectic, spiritually, and socially conscious reggae band with a profound cultural base and deep rooted sound." 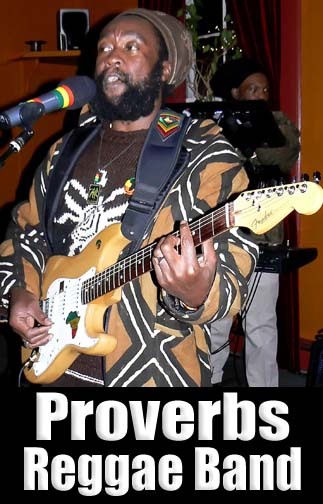 Proverbs performs an extensive range of genres, which include "SKA, ROOTZ REGGAE, GOSPEL, JAZZ, R&B, COMPAZ, ZOOK, SOUL, and a splash of CALYPSO." Proverbs has shared stages with a host of international artists over the years. They include Half Pint, Freddie McGregor, Chuck Brown, Collie Bud, Wyclef and Luciano, to name a few. 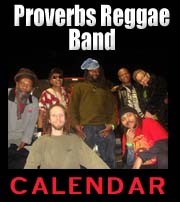 Proverbs has performed in the D.C. area since 2000 and have won several Reggae awards. Manager/Lead Vocals/Songwriter/Rhythm Guitar. From the Caribbean Island of St. Vincent and the Grenadines. Percussionist/Drummer/Background Vocals. Sven is from Frankfort Germany. Vocals. Freedome comes to us by way of DC, VA, and New York.